Pictured: closeup of Walt! Gorecki's diorama. Photo: Lana Estrada. 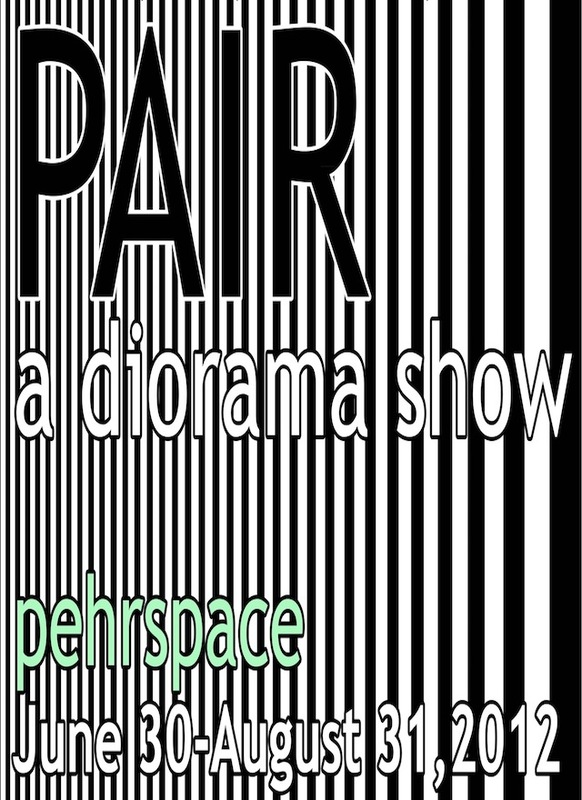 From this Saturday, June 30 until the end of August, Pehrspace will play host to PAIR, a group diorama show curated by Pauline Lay and featuring the work of Dawn Anderson, Abby Banks, Rachel Birke, Emily Burnett, Clark Canez, Disco Cisco, Craig Davis, Danielle Descoteaux, Lana Estrada, Walt! Gorecki, Sarah Heysel, Pauline Lay, Josh McCool, Mackenzie Owen, Paax, Simon Sotelo, Pascal Stevenson, and Rion Suarez. PAIR opens at 8 PM on Saturday, with a performance by Wet Power at 10. I went to Pehr last night to find Pauline’s office filled from wall to wall with colorful and creative dioramas. I was blown away by the variety of approaches that these artists and hobbyists applied to the theme. Overall, it’s a diverse and endearing show. According to Pauline, “my main interest for curating art shows is to see thoughtful interpretations from traditional artists/ hobbyists/academics when given a theme and a basic childhood form to express it with.” PAIR follows an earlier show featuring mobiles and the theme of “systems” and includes a variety of contributors including an IT person, a marketer with a love of American history, and an origami hobbyist. Over the week, I did short email interviews with some of the artists involved in PAIR. They told me about some of the dioramas you’ll see. Pictured: Simon Sotelo's "Folkmote." Photo: Shaddy Zeineddine. 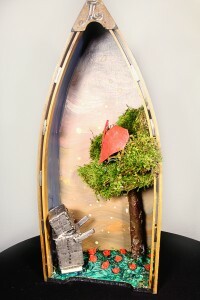 Simon Sotelo’s diorama is a mixed-media sculpture illustrating a scene from a song called “Folkmote” by Donny Hue and the Colors. 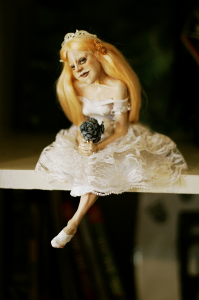 The centerpiece, a sculpted fairy tale bride, is beautiful in its creepiness. For more about Simon, visit http://hiresimon.com/. Pictured: Disco Cisco's miniatureMUSEUM. Photo: Thomas Pathe. 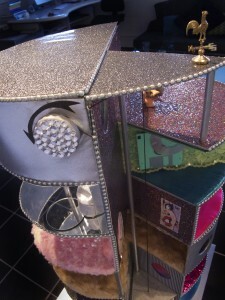 Disco Cisco’s miniatureMUSEUM is a petite, seven-story structural experiment in wood, textiles, and ingenuity built to exhibit original wee works by a collection of local artists. Visit Disco Cisco online at http://www.intergalactic-fantastic.com. 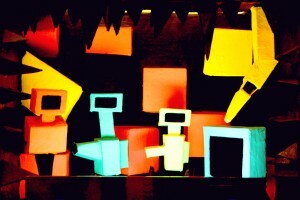 Papier-macheist Paax’s black light sculpture, “Parallel World 23,” is extraordinarily trippy. “What interests me,” he says, “is absence of message or connection. I feel that some Parallel Worlds are maybe so entirely alien that there may not be anything human about that other reality. Nothing human at all.” Whoa. You can see more of Paax’s objects at http://amoebyspaax.wordpress.com/. Pictured: Paax's "Parallel World 23." Photo: Lana Estrada. 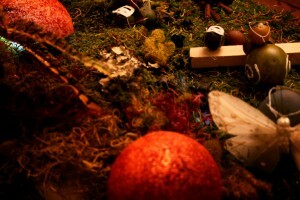 Clark Canez created a diorama using the Pepper’s Ghost illusion (like in the Haunted Mansion at Disneyland) to create a “ghost diorama show” staged at Pehrspace. This light trick, unfortunately, made the piece impossible to photograph — so you’ll just have to check it out in person! You can follow Clark on Twitter. http://twitter.com/otherclarksy. Pictured: Lana Estrada's "Antisocial Butterfly." Photo: Lana Estrada. Professional photographer Lana Estrada’s piece, “Antisocial Butterfly,” makes beautiful use of mosses and feathers to create a vibrant buggy party. Lana’s photography site is here: http://lanaestrada.com/. Dawn Anderson's "I would love you with my whole heart, if only I could (A Quest for True Love)." Photo: Lana Estrada. Check out Dawn’s website at http://humanclockwork.com/. I couldn’t find a website for Josh, but I did find this.